The history of wine spans millennia: the ancient Romans considered the beverage a daily necessity, Phoenicians wrote the first textbooks on viticulture, and Egyptian pharaohs had wine cellars built into their burial tombs. Now, recent archaeological findings from Israel promise to add new insights to our knowledge of wine drinking practices throughout the ages. A team of researchers from George Washington University and Tel Aviv University have discovered what they believe to be an ancient wine cellar in the Northern Israeli city of Tel Kabri. Part of a buried Canaanite palace, the site is estimated to be about 3,700 years old. 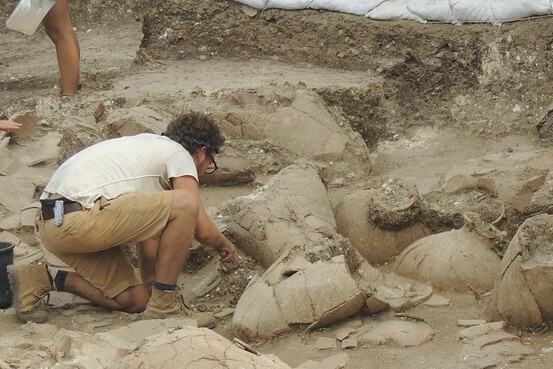 Excavations of the space revealed forty large jugs – enough to hold about 2,000 liters (or more than 528 gallons) of liquid. Of course, their contents are long gone. But chemical analysis of the jugs’ inside lining revealed traces of tartaric and syringic acids: telltale signs of wine made from grapes. The analysis also revealed the use of several flavor additives such as honey, mint, cinnamon, and tree resin. The wine may not have appealed to a modern palate – but still, the research team suggests that it must have been the product of a sophisticated recipe: the composition appears to be uniform across all 40 jugs. In fact, scholars believe that the Canaanite winemaking industry was already well-established by the time this cellar was put to use: they estimate that wine was made here as early as 05,000 BC. But while this cellar might therefore not be the oldest one around, the site still has plenty to tell us about the culture of wine drinking in this ancient town. For example, both the use of herbal infusions and the relatively limited quantity of jugs suggests that this was a special wine, intended for use at the palace. Further chemical analysis may tell us more about the wine’s composition, allowing us to learn something about the flavor preferences and wine-making techniques of 01,700 BC. And who knows – we might even be able to recreate this ancient recipe and get an actual taste of what the upper classes drank all those centuries ago.